You might also like our conversation on the best portable pitching mounds. 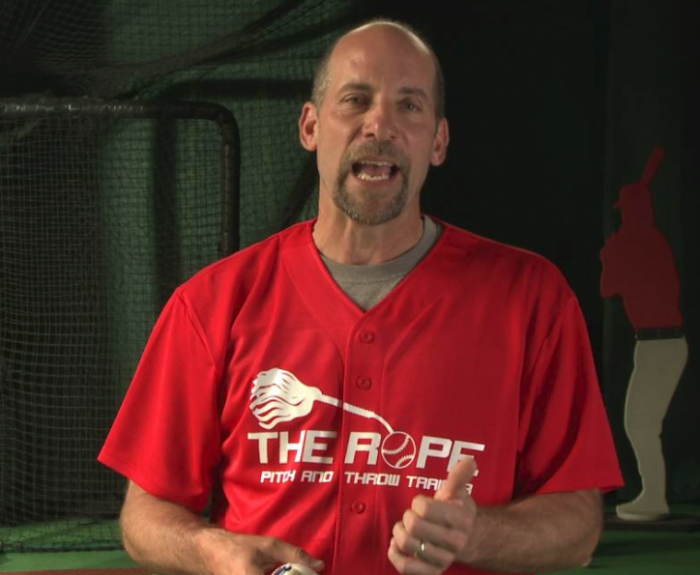 Endorsed by Major League Baseball Hall of Famer John Smoltz, the Rope Trainer is a multi-level resistance throwing simulation device that can be used by youth athletes all the way up to professional baseball players. Available in single, double, or triple tethers, the device will meet the throwing, training, and conditioning needs of each specific athlete. Each tether adds another level of resistance to the throwing motion. The device is not only for pitchers, as any position on the field of play can benefit from using this product to simulate throws and continually condition and strengthen the player’s arm and shoulder. 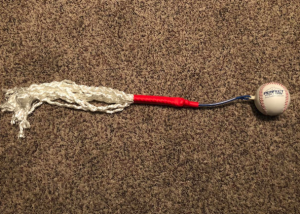 The Rope Trainer was designed to improve the confidence of the thrower, while increasing velocity and accuracy. Sometimes the exercises performed to increase the velocity and accuracy place great strain on and cause eventual damage to the athlete’s arm and shoulder. This device allows for instant feedback to allow for adjustment of the athlete’s throwing or pitching motion, thus reducing the chance of the development of bad habits, which in turn, lead to arm/shoulder fatigue and possible injury or semi-permanent damage. Helps all players to improve grips, develop stronger fielding motions and throwing speed and accuracy. Can be used with or without a target as a warm up device to ensure proper extension. Overcomes potential fatigue and injury that occurs when training without proper finger and grip orientation. Reinforces balance, extension and follow-through. Enhances throwing flexibility and range of motion. 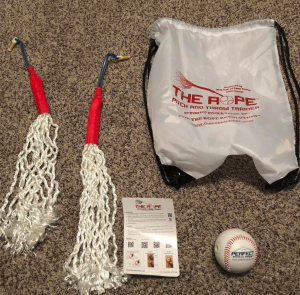 The site continues on to say that players age five through high school age have enjoyed great success when using the the Rope Trainer in their preparation for and during the actual baseball season. The site claims that reduced fatigue and injury have been the desired results, but increased player confidence, accuracy and throwing speed increase of 8-10 miles per hour have been recorded. The site, however, does not show any visual proof of the last statement. With proper arm care and training however, one would expect marked increases in speed. I personally purchased this product last year with the intent of implementing it into my son’s and our 11u baseball team’s pitching/arm care/conditioning regime. Being a father of a pitcher, it bothers me when pitchers are overused or not properly trained/monitored at such a young age. I feel that this product will help in the conditioning, stability, and longevity of arms as the kids move into the teen years and possibly advance their baseball careers past the travel/high school levels. As you can see, the device comes in a nice drawstring carrying bag. I purchased the dual tethered unit, which included the ball itself, two tethers, and a instruction guide on recommended usage per age group. You can use only one tether or hook in both for a higher level of resistance. There is also the option for a third tether that can be applied to the ball for maximum resistance, but at the age level, I felt unnecessary at this time. I have yet to find the device sold through any resellers and the only place to find it is on the website itself. There have been some coupon codes available in the past, but I did not have any luck finding an available one as of this writing. Tired of pitching? Find the best pitching machines. Jason Wilson is a baseball enthusiast, with an addiction to reading, reviewing, and testing baseball equipment and accessories. 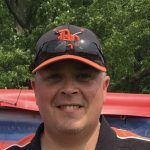 He has been involved in youth baseball for eight years while continually working to find a way to make the game a better experience for both players and parents.